The "LeBron Effect" has been immediate for the Lakers. Los Angeles signed the NBA's biggest free agent in July and three months later, ticket prices are up nearly 49% over last season, to a $444 average asking price on the secondary market. 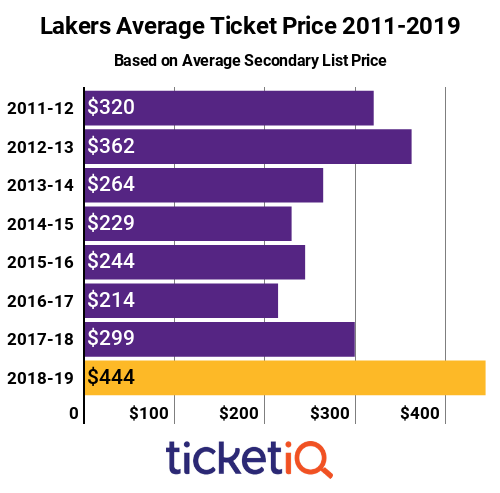 Below is how 2018-19 Los Angeles Lakers tickets stack up on the secondary market over the last decade. 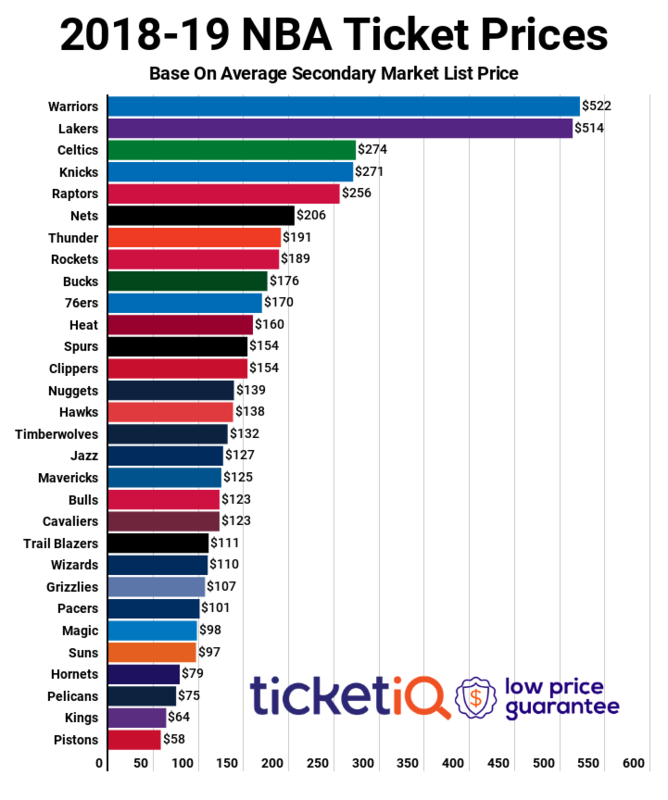 Prices are the highest in the last eight years, since TicketIQ.com began tracking NBA ticket data. The next most expensive Lakers tickets since 2011 were $362 in 2012-13, which is the last time the Lakers advanced to the playoffs. 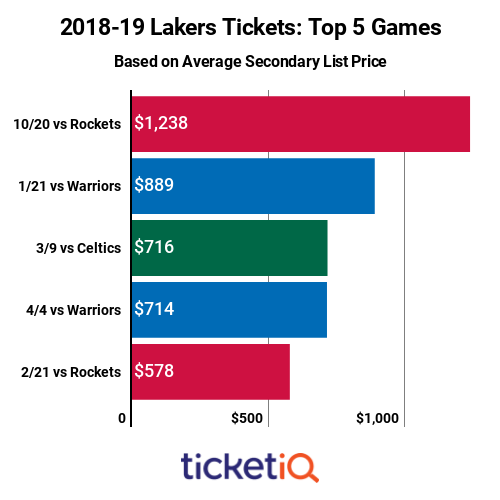 The Lakers have the second most expensive ticket in the NBA heading into the 2018-19 season, behind only the defending NBA champion Golden State Warriors. The average asking price for the Warriors is $463. Even during the down years, Lakers season tickets were hard to come by, and the team is again sold out, though fans can join a waiting list for season tickets. On the secondary market, TicketIQ.com has season tickets available for $22,750. Single-game tickets are available through the team's primary ticket partner, AXS, though most games are nearly sold out on the primary market. For secondary market tickets, TicketIQ has seats available for all games. Since LeBron joined the Lakers, demand for Lakers games across the country has shot up. At Staples Center, the home opener is by far the priciest game -- with a $1,238 average asking price, according to TicketIQ.com. That game is the third most expensive across the NBA this season. The two most expensive are $1,768 for the Christmas Day Lakers at Golden State game and $1,379 for the February 2 Lakers at Golden State Game. The Lakers are involved in six of the season’s Top 10 games in terms of price. While the Lakers-Rockets rivalry dates to the 1980's Los Angeles "Showtime" era, the spike in demand for the October 20 home opener is most certainly about James as a Laker. TicketIQ.com has seats available for the game, including those in Section Upper Concourse 314 starting at $282 or courtside seats behind the team benches in Loge 110 beginning at $3,875. The next most expensive game is January 21 vs. the Golden State Warriors, and tickets are averaging $889, making it the fourth most expensive game of the season overall and the Lakers second most expensive home game.